As we head into the new financial year, we reflect back on the Kamvalethu Foundation’s impact this past year and look ahead to what is to come. Over the course of 2018, the Kamvalethu Foundation distributed the largest amount of money towards development projects, to date. We also faced some legislative changes. These changes will ultimately result in even more money being made available in support of our projects! With this and the anticipated increased spend in mind, the Board held a time of reflection and strategy towards the end of the year. Here we present you with some of our thinking moving forward. Faced with overwhelming research we truly believe that the best investment we can make is in Early Childhood Development (ECD). Over the next five years, the Kamvalethu Foundation will invest the majority of its funds into ECD and literacy. This will be done within a specific geographic location in the rural Eastern Cape, South Africa. Why These Key Focus Areas? Return on Investment. ECD is one of the most cost-efficient investments in human capital which leads to a country’s sustainable development. Education/ Income Relation. Children who do not read proficiently by the end of third grade are more likely to leave school prematurely. Research shows that with each grade you progress to, over a lifetime, your earning potential grows significantly. Critical Brain Development. The critical times in brain development (the development of sensory pathways, language and higher cognitive function) are developed even before children start school. The components of the essential ECD package are well researched. The interventions for success are relatively straight forward and achievable. These include maternal and child health services, nutritional support, support for primary caregivers, social services, and stimulation for early learning. Reading for meaning by Grade 4 is the critical skill to address. In a country where 78% of children cannot read for meaning in any language, this skill upon which all other skills depend is missing. Rural areas are overlooked. Hard to reach areas are often left out of the development agenda. There are 884,000 children in the Eastern Cape under the age of 6 (the third most in the country). 60% of these children are rural and 79% live in poor households. Many of these children live in single-parent households. The Kamvalethu Foundation’s purpose and strategic direction have global relevance in the United Nation’s Sustainable Development Goals (SDG’s). ECD is incorporated across most SDG’s but most notably goal number 4. The South African National Development Plan (NDP) includes a target of achieving universal and equitable early childhood development by 2030. We will be working with our current project partners in the Eastern Cape, as well as some new potential project partners to see how we can achieve the best results. Our ultimate aim is to say in 2023 that 78% of the Grade 4 learners benefitting from our projects can read for meaning! We received some encouraging feedback from Ikhaya Labantwana Montessori and Ncinci Ones Montessori’s School Readiness Assessments. These assessments were run for the first time at the end of 2018. The results were compared with another excellent institution in Cape Town, and are promising! We will make some tweaks moving forward, but it is amazing to have this tool to give us an indication of how the children are doing. 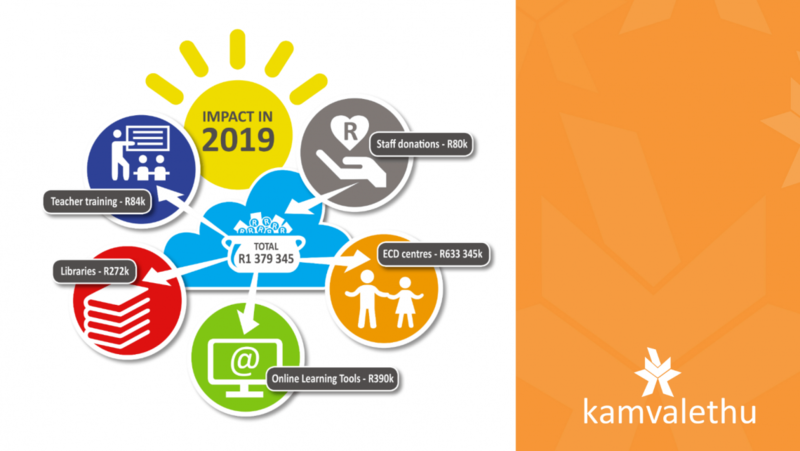 There are a number of ways for staff to get involved with the Kamvalethu Foundation in 2019. To find out how, staff can look out for the staff involvement sheet on the staff noticeboards, chat to their Kamvalethu Foundation business representative or pop Lauren an email. Donating time.Companies can choose to use a CSI day as a team building opportunity. All they need to do is decide on a time, day and project that would suit them; this can be an add-on to an event or a focus for the whole day. We have many ideas to choose from! Donating skills.Occasionally there are opportunities to assist our project partners with some challenges they may face. Previously, staff have assisted with fine-tuning budgets, marketing strategies, setting up newsletters, helping with copy and the measurement of outcomes. If staff feel that they have the relevant skills to offer – they can be proactive and let us know. Donating money.To help extend the Kamvalethu Foundation’s reach staff can choose to donate money in their private capacity. All donations are Section 18A tax deductible and will go towards our project and operational costs. Such donations ensure we continue to support research-based, top-notch projects in under-resourced areas. For more information and a link to all the resources please visit our strategic planning document or get in touch with us – we would be thrilled to go through our thinking with you.